Breeding stock Boars available by reservation only. Email or call us for more infomation. We are ALWAYS happy to talk PIG. 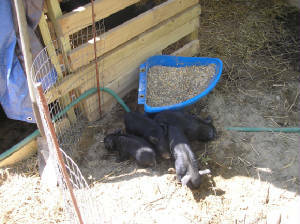 As of May 24 2009 we have two boar babies available. If these are not reserved by June 5th they will be castrated. Date:_____ I________________________________________ agree to purchase the following A.M.H.A. REGISTERED MULEFOOT PIGS from: PBJ Farm. Reservations are filled in the order in which they are received. Please contact the seller prior to sending deposit, to determine purchase price, availability & any applicable discounts. The deposit of $50.00 is to be remitted with this contract. If shipping by air, pigs must be paid in full by 6 weeks of age. If you are picking up your pig, you may pay the balance in cash at the time of pickup. Pickup is to be made at 8 weeks of age. Make checks payable to: PBJ Farms / Pat Patrick. All pigs must be paid for in full before leaving our farm. Shipping costs & crates are not included in the price of the pig, and are the sole responsibility of the purchaser. Owner arranges all shipping promptly when pig is paid in full. All Shipping costs are COD to the airline. Seller will notify Purchaser of current airline pricing. Seller ships pigs at 8 weeks old, or the next available date, pending weather & airline restrictions (no less than 22 degrees and no more than 85 degrees at any point during flight). For pigs being shipped, full payment must be received by six weeks of age or sales are null and void and deposits retained. A $50 delivery fee to airport will be added to cost of pig. The cargo department of receiving airline must be open upon delivery. An airline approved crate is required. We recommend Dr Fosters and Smith "Pet Dens". Seller must receive one crate per pig by the time the piglet is 6 weeks of age. These crates can be reused. You may purchase and have shipped directly to our farm. Pigs leave our farm healthy and sound. The owner and/or farm is not liable for any injury sustained by a pig during flight. Once the pig is released to the purchaser or the airline, The owner & farm is not liable for any injury, illness, death or veterinarian fees due to improper handling, feeding, medication, misc. ailments, etc; as we cannot guarantee proper care of the pig after purchase. It is the purchaser’s responsibility to gain the knowledge necessary to properly care for the pig. The owner will answer any questions to the best of our knowledge regarding the care of pigs. All veterinarian certificates & inspection costs are the responsibility of the purchaser, & will be added to the purchase price of the pig. The seller assumes responsibility to present the pig to the veterinarian for said inspections. Purchaser must notify Seller of specific certificates/tests required by Purchaser’s State veterinarian no later than 14 days before pickup/shipping. If Purchaser decides not to complete this transaction, Purchaser will forfeit any deposit. Purchaser has the opportunity to visit Seller to visually inspect said pig, & is accepting pig "as is" if shipping via air. The listed owner & Farm will forward pictures of available pigs when requested, if photos are readily available. In the event that the reserved pig is not available due to illness or death, Purchaser’s deposit will be refunded, or another pig will be made available. A signed copy of this contract will be returned to Purchaser. I agree to update my contact information if it changes, if PBJ Farms are unable to contact me I will forfiet my deposit. PBJ Farms - Pat Patrick, Barb & Nancy - Reservation form valid with any signature from PBJ farm.